Christine Haynes Emery Dress with Tie Sleeves Hack Sewing Pattern Review. O.k I know, I am a little late to this party. 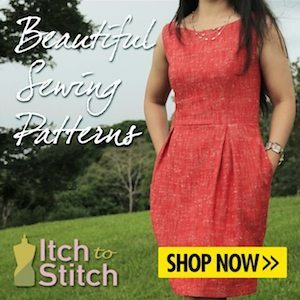 The Emery Dress is an incredibly popular dress in the sewing community, and for good reason. It’s a classic shape, slightly vintage inspired, and has a fitted fully lined bodice and full skirt. I have owned this pattern for several months now and have been waiting for the weather to get a little warmer before I joined the ’emery club’. Three or four weeks ago I spotted a dress in the High Street and really loved it, and although I was very tempted to buy it I decided that it had a similar shape to the Emery and thought I would have a go at recreating it myself. The most obvious difference to the Emery pattern is that the dress I had fallen in love with had cute keyhole tie sleeves. No problem, I can have a go at this hack myself. So I did. 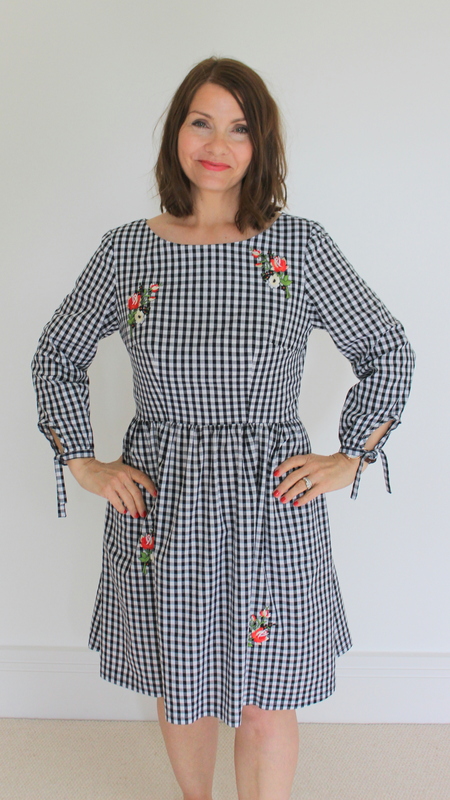 I really love the black and white gingham, cute but not too ‘primary school summer dress’ (I hope). You will not be surprised to hear that this was purchased from Minerva Crafts – I love their fabrics and the prices are good. The rose appliques were a little more tricky to source. I could find them fairly easily online but they were expensive (I wanted 4), and other more reasonable appliques that I could find more often than not had to be sent from China. I did not have time to wait for post to arrive from China! After a little more research I stumbled upon some pretty iron on applique flowers from www.ellu.com they were only £4.49 for a pack of two with free delivery. I ordered two packs and they arrived by return. They ironed on easily, following the instructions on Ellu’s website, and seem pretty secure. I haven’t put it through the wash yet though so cannot vouch for how good they are after going through the washing machine, but so far so good. I guess you could follow up with hand stitching them if necessary. The dress is so lovely to make. I really liked that the bodice is lined. You might want to know that the bodice front has 4 darts – 2 at the bust and 2 at the waist. The bodice back also has 4 darts – 2 at the back of the neck and 2 at the waist. This means that with the bodice front and back and the bodice lining front and back you are sewing 16 darts in total. Might be worth knowing if you are not a fan of darts! Of course these darts provide you with a beautifully fitted bodice and are totally worth all the effort! Ignore the unfortunate crease in the fabric which runs from my under arm to the bust dart. It looks like another dart but is just a crease/fold in the fabric due to my arm placement! The skirt has in seam pockets. Oh yes. You know I need to have pockets in a dress. The dress closes up the back seam with an invisible zipper. Not the best pattern matching, don’t judge me.. So, the sleeves, my favourite part. 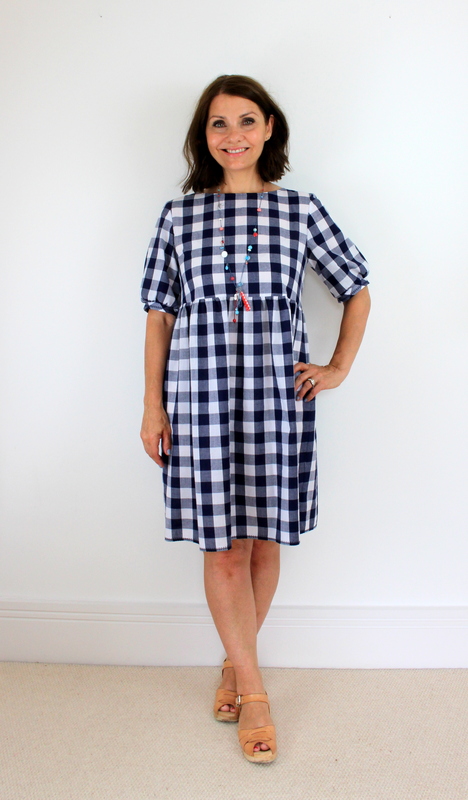 Now the original Emery Dress has a choice of short or 3/4 length sleeves. This was perfect because the dress I was trying to recreate has 3/4 length sleeves so it was just a case of using these but just adapting them slightly. I created a little keyhole shape at the bottom of each sleeve piece, cut some gingham strips on the bias to edge this cut-out, and finished it all off with a length of gingham along the bottom to create the tie. If you would be interested in reading my tutorial on how I made these tie sleeves, then head over here to read my blog post and find out how! This pattern has been rated 3/5 for difficulty by Christine Haynes, and I would agree with this. Lots of darts, a bodice lining, an invisible zip, gathered skirt and set in sleeves are the challenges of this dress. Ooh I almost forgot to mention that you also have the choice to add a vintage style bow at the front centre waist, or a flat pointed collar on this pattern. These are pretty cute and might feature in my next Emery. All in all I am totally in love with this dress. It has been so satisfying to have a go at recreating something that I had seen on the High Street for myself, and I am pretty pleased with the results. I already have some fabric lined up for my next Emery Dress, so look out for that later in the Summer. Have you made a handmade version of an article of clothing that you have seen elsewhere? I would love to hear about it.